Yaroslav-Roman Alexandrovitch Tagamlitzki was born on Sept. 11, 1917 in Armavir, Russia. His family emigrated to this country in 1921. After graduating in 1936 from the Second Boys' High School in Sofia he entered the then Physico-Mathematical Department of Sofia University as a student in mathematics and completed his studies there in 1940. From 1940 to 1942 he was an assistant at the Mathematical Institute (then the mathematical division of the department) of the University, The time 1942-1943 Tagamlitzki spent as a postgraduate in Leipzig under P. Koebe and B. L. van der Waerden, where he got his PhD. Back in Bulgaria Tagamlitzki did his army service and in 1945 was again assistant at the Chair on Differential and Integral Calculus of the University under Kyrille Popoff (1880-1966). Successively he was elected Privatdozent (1947) and Associate Professor (1949). After the retirement of Popoff in 1954, Tagamlitzki became full Professor and headed the chair until the reform in 1970. In 1961 he was elected Corresponding Member of the Bulgarian Academy of Sciences. 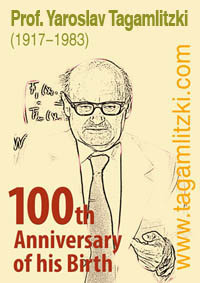 After the Institute of Mathematics was established in 1947 within the Academy, in 1961 its Section on Functional Analysis emerged, headed by Tagamlitzki. The reform of 1970 that fused the sections of the Academy and the chairs of the University brought him the position of the head of the new Sector of Functional and Real Analysis at the Centre of Mathematics and Mechanics. For his research achievements Tagamlitzki was awarded in 1947 with the Prize of the Committee for Science, Art and Culture, in 1952 with the Dimitrov Prize for his study on the Abel interpolation series 21. He received twice the "Cyrille and Methodius" order and was also awarded the title Merited Scientist in 1982. Tagamlitzki's talent made him a brillant high-school and university student Then appeared his first publications (1, 2, 3]. The lifework of Tagamlitzki began with his papers during the period 1946–1952, where he started studying a variant of the notion of extreme point in general spaces. Already in that early period he used the term 'irreducible' element. His investigations led him to an independent discovery of a variant of Krein-Milman's theorem. Later on, he generalized these ideas for topological spaces and introduced his so called 'topological induction'. Through his efforts functional analysis became a flourishing branch of mathematics in Bulgaria. The influence of Tagamlitzki's work and personality during the period 1950-1970 was predominant in the Bulgarian mathematical community. First of all, he was a born teacher. His devotion to lecturing was moulding the younger generation and his charismatic personality had a great attractive power. His famous seminar for university students and young people was a focus of the postwar development of pure mathematics in this country. Almost every creative Bulgarian mathematician emerging in the fifties was in one or another way linked with Tagamlitzki's seminar(s). He is also author of the first modern Bulgarian textbook on calculus (first edition in 1954, sixth in 1978) . He was the first to deliver courses on real functions, integral equations, algebraic topology, Fourier series and the theory of distributions. His very popular lectures on Functional analysis were always based on his current research interests. During all his long stay at Sofia University he has always maintained contact with the secondary education. He has delivered numerous populat lectures for secondary school audiences. Tagamlitzki also developed a new method to introduce calculus foundations to school students and personally takes part in its pilot impelmentation at a Sofia school. He has lectured on secondary school teching at Spring Conferences of the Bulgarian Union of Mathematicians. Tagamlitzki was one of the most widely educated people not only in the mathematical community. He was not only fluent in all modern international languages but was an expert in many ancient ones. He had systematic and profound interests in archeology, linguistics and theoretical medicine. But at the same time he was a modest man. He did not show up much at international fora and did not leave enough written material on his extramathematical investigations. Professor Yaroslav Tagamlitzki, corresponding member of the Bulgarian Academy of Sciences, head of the Sector of Functional and Real Analysis at the Centre of Mathematics and Mechanics died on Nov. 28, 1983. His sudden and premature death brought to his funeral on short notice many hundreds of his stutents and followers over the years. He was a talented and modest man. His unique, witty and charming personality will allways stay in the memory of those who had the privilege to know him. "... In this moment of grief, when we bid sad farewells to the great scientist, teacher and person Yaroslav Tagamlitzki, we have to think of ways to cherish his memory best. There are numerous possibilities, but two of these I consider the most important. The first one is to persist in the scientific work of Tagamlitzki. Naturally this is beyond the competence of but a few of his close successors. The second one, however, is within the grasp of all of us. And it is — to aspire to always act honestly, unselfishly, and unreservedly, as he has demonstrated to us by his entire life. Let us bow in profound reverence to the memory of our unforgetable teacher and collegue Prof. Dr. Yaroslav Tagamlitzki!" Copyright (c) Ad-Hoc 2008-2015 (www.adhoc-bg.com). All Rights Reserved. Last updated: Wed May 24 2017 at 10:04:52pm.